RFPMonkey is a web-based request for proposal (RFP) software which enables users to build a centralized online repository of RFI and RFP documents for reuse. Users can upload RFP questions in CSV format, copy-and-paste questions, or enter them manually into the content library. Flexible categorization allows users to group questions and responses according to their own organization system. Entries can then be searched for in multiple ways - exact searches can be carried out to find precise matches for individual words or short phrases, and relevance searches can match entire questions or responses. Users can also leave the search mode set to ‘auto’, allowing RFPMonkey to select the ideal search type. Search results can then be filtered using the 9 built-in, configurable filters. With RFPMonkey, users can set entry aging policies to periodically expire content, to assist users in keeping their content library fresh and up-to-date. Users can select whether or not to use entry aging, and define how aggressive it is, with expiration periods from 30 days up to one year. RFP statuses, important dates, assignments, notes, and outcomes can be recorded, and progress tracked. Assignment acknowledgements can also be monitored, and reminders automatically sent for overdue assignments. RFPM Monkey has had an amazing impact on my team's productivity! With our ever evolving responses, the question expiration settings have been invaluable. We're able to keep our responses up-to-date via a few clicks and our company on top of their game! The UI is intuitive, but there are a lot of options. Basic users often get overwhelmed with navigating through. Thank you Heather. Entry Aging is certainly a valuable feature, as knowing that your content is up-to-date is vital. I can see how basic users could get a bit lost. We'll look at simplifying (without losing functionality). In the meantime, keep in mind that the UI removes links that are not accessible based on a user's permissions. So you might consider creating limited User Roles for your basic users. This will hide from them features that you don't want them using anyway. Also, we would be happy to run an overview/refresher session for your team to make sure that everyone has what they need. Thanks Tony. Our customers are in Software, Healthcare, Wealth Management, IT Services, etc. One thing that makes it work in such a range of industries is that you can change the names, meanings, and functions of most of the baked-in filters. You can also define new Knowledge Types on the fly as well as ear-mark certain entries as 'Internal Only'. No argument from us on the 'Sexiness' of the UI. We certainly focus on the function over the glitz. Again, thank you for your repeat business with us. RFP Monkey has been a valuable tool for us as we categorize and expand our proposal content. I am a knowledge manager and use RFP Monkey to store, categorize and build our content library so we have continuous access to our gold standard content. Features such as assigning SMEs, document expiry, categories, search function have all been very useful to me in creating a library that is up to date and of value to my users. I must add that the customer support has been excellent. The lay out could definitely be better and I would like to be able to customize more so my users are not overwhelmed by the information available. Thank you Ashwini. We appreciate your support and value your inputs. We are in the middle of some UI tweaking which will help some of your users. Please also be aware that there are some configurations/customizations available based on permissions that you don't currently have access to. Also, we are always happy to receive enhancement requests. If there are specific customizations that are of interest, please submit them through our on-line Support Portal. We evaluate each request. Some are already available (but controlled by someone else in your organization). Others are not yet available but are good candidates for standard enhancements. Some requests aren't right for all clients but can be built as client-specific code. We don't do many of those, but they do happen. My firm has used RFP Monkey for the past 6+ years and we have been extremely satisfied! -Ease of use -Scalability of the tool -Extremely responsive client support -Very useful in our inter-office business development activities -Any issues that have come up have been swiftly addressed by the support team. Merci Frédéric. Votre soutien depuis 2011 est grandement apprécié. Aussi bénéfique que RFPMonkey a été pour vous, je pense qu'il y a encore plus de valeur à atteindre. Je voudrais vous présenter quelques fonctionnalités que je ne crois pas que vous utilisez actuellement. Faites-moi savoir si / quand vous souhaitez planifier un examen rapide. Thank you Frederick. Your support since 2011 is greatly appreciated. As beneficial as RFPMonkey has been for you, I think there is more value yet to be achieved. I would like to introduce you to a couple features that I don't believe you are currently using. Let me know if/when you would like to schedule a quick review. The database is easy to input or edit entries, and easy to search. It is also easy to customize based on our needs. I find it a bit hard to manage old entries, perhaps due to the layout. It can feel a bit overwhelming. Thank you for the feedback. Ease-of-use and powerful search are cornerstones of our value. When it's convenient for you and your team, we would like to show you RFP Triage and RapidResponse. These apply the search technology to every question in your RFP vs. the single-search method you are currently using. There may be ways help you with managing older entries too. In addition to the Entry Aging setting in effect, be aware of the search macros that show you which entries are due to expire within 5, 10, 30, or 45 days. There are also search macros that show you which entries have been edited or approved today, within the last week, last month, or YTD. There is a one-off $250 setup fee for all plans. RFP questions can be entered manually or imported from CSV files to build a content library, with editing tools and flexible categorization. Content can be searched for using exact searches to match words or phrases, or relevance searches to match questions or responses, and filtered with 9 built-in configurable filters. Content can be set to expire after a given time period using Entry Aging, to ensure content remains fresh and up-to-date. RFP progress can be tracked, with users able to record important dates, statuses, outcomes, notes, and team assignments. Assignment acknowledgement can be tracked and reminders automatically sent for late assignments. Below are some frequently asked questions for RFPMonkey. Q. 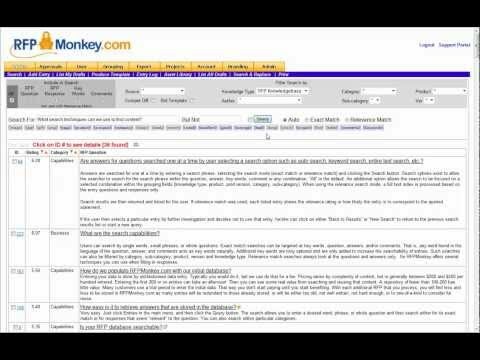 What type of pricing plans does RFPMonkey offer? Q. Who are the typical users of RFPMonkey? Q. What languages does RFPMonkey support? Q. Does RFPMonkey support mobile devices? Q. Does RFPMonkey offer an API? No, RFPMonkey does not have an API available. Q. What other apps does RFPMonkey integrate with? Q. What level of support does RFPMonkey offer? Q. Which apps is RFPMonkey compared to most often?